Aspects of Our Rich Inheritance. irelandphoto.com >> local history >> Aspects of Our Rich Inheritance. 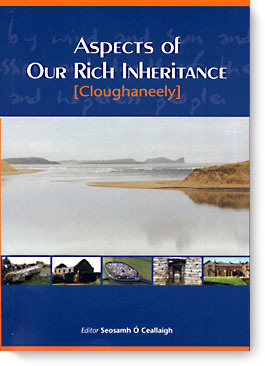 This significant new publication, produced locally, provides a fascinating insight into our local parish of Cloughaneely and its people from pre-Christian times to the present day. History, architecture, folklore, legend, and language are combined together with original photographs and illustrations. The book is suitable for educational use, with worksheets and questions for each chapter. A5 (148x210mm), 240 pages. Full colour cover, single colour throughout. In English and Irish. Published May 2000.
irelandphoto visitors may obtain their home-delivered copy of this publication for the special price of €19-05 (IR £15-00 inc. P+P).